If your passion was shopping, as was the case for one student, he researched Trajan’s Market and created a virtual ancient shopping mall. Another student examined the experience of a Roman soldier with his father’s own experience during war. 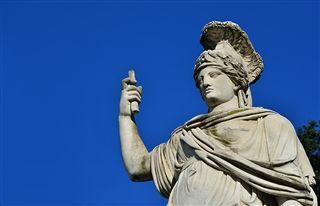 In comparing and contrasting the goddesses of wisdom and warfare, Minerva (Latin) and Athena (Greek), one student uncovered “startling” differences between the two that Lamb likened to college-level work. The class also included some fun and games as one student examined the Saturnalia celebration and staged some activities to celebrate the winter solstice. And, although Kingswood Oxford does not condone any form of retribution, if you ever need to invoke a curse on someone, a student created a Wiki how-to curse tablet. In each case, the students created a website or finished product like the finely wrought geometric mosaic comprised of tumbled marble tiles that one student designed while studying Roman art. Lamb monitored the students work to make certain they were on task with accountability sheets. The students decided the format to present their findings and managed their time well throughout the ten weeks. Since the students had a high degree of experience with the language, Lamb was confident that the students could tackle these independent projects. After the research, the students presented their findings to the class. “It was great to see them as the experts in the subject matter. There’s real buy-in on their part because I didn’t randomly assign the topic or format. Since they selected these topics themselves, it made the students more accountable.” In a passion-driven classroom, we’re giving our students room to explore their authentic interests and dig a little deeper to own their learning journey for life.